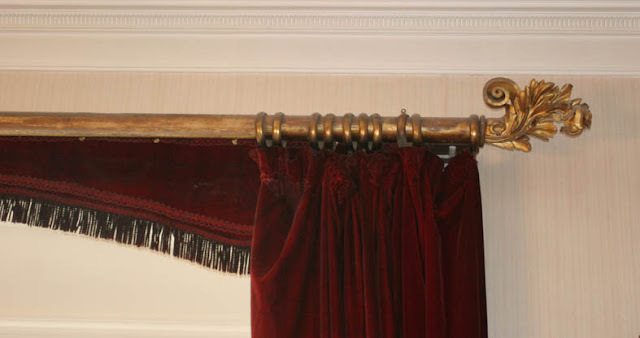 There is a curtain pelmet type that I can only describe as 'Pelmet behind a pole'. 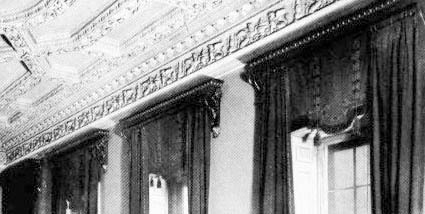 I call it curious because most pelmets, or valances, are fitted in front of the curtains, not behind them. 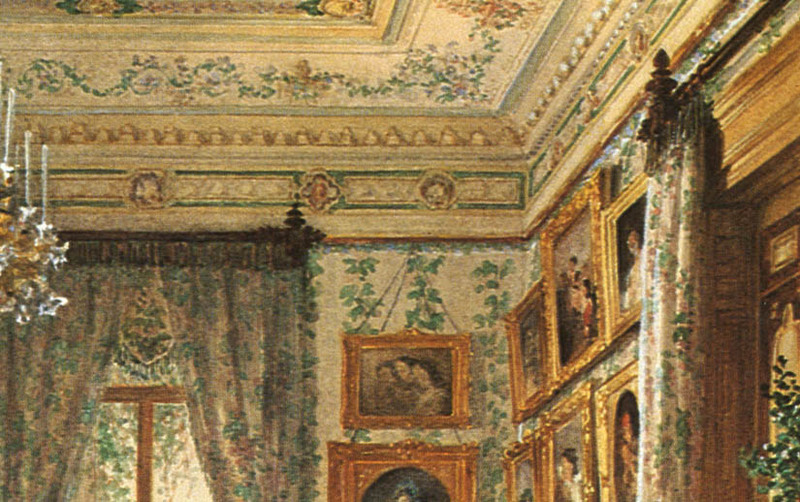 The first time I noticed this arrangement was in an article on Stanley House in London, where designer Nicky Haslam had curtains made based on a 19th century water colour of the same room. 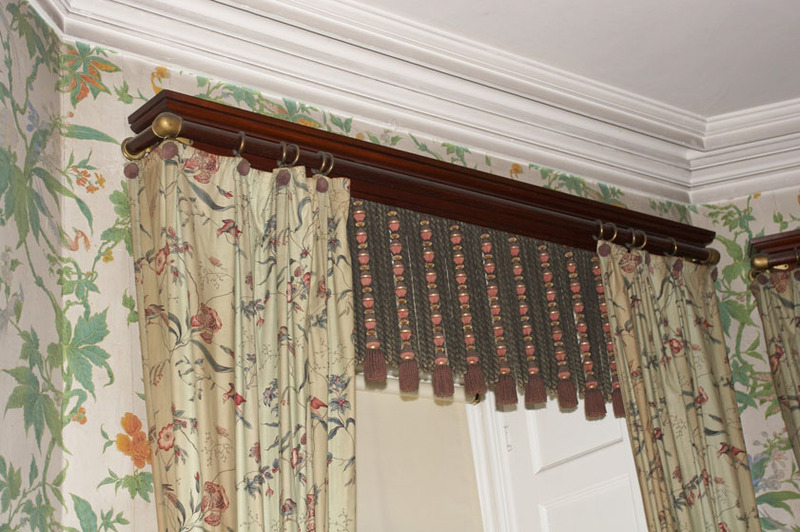 So these are curtains that hang from a fairly prominent and decorative pole, in front of a (usually flat) valance, which fills the space between the pole and the top of the window. In this room, the curtain pole is right up to the ceiling, but the top of the window is much lower; about 70 cm I would guess. The space in between is filled with a flat pelmet; it is not a blind that moves up and down; it is a fixed piece, probably lined and interlined, or even stiffened, covered in a fabric with a braid and a fringe attached. I have only come across this type very occasionally, but it is not without its merits and nor without its history. Its merits are that when the windows are not very high, you can still have the impact of tall curtains right up to the ceiling, with a large decorative curtain pole. The pelmet underneath, meanwhile, takes care of the bare wall that you would otherwise see. Behind the pelmet, secondary curtains can also be fitted, on invisible tracks. When top and under curtains are both on poles, it tends to become a bit busy. Also, any other type of pelmet would hang in front of the curtains and would therefor cut across them, reducing their height and impact in the room. Nowadays, most pelmets are deemed too fussy, but this type might just work, even in contemporary interiors. And it has history - as here, in the water colour of around 1830, used by Nicky Haslam. I'm just going to show the very few examples that I have found among historic images. 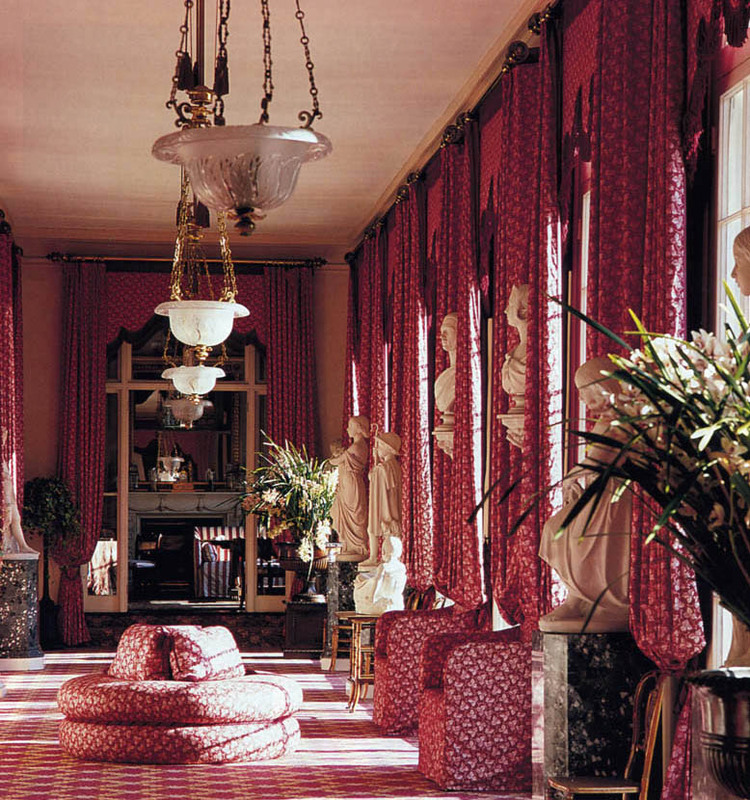 The earliest one is a design from ca 1825, by the influential firm of Gillows, which shows three different curtain designs. The one on the right concerns us here. The one on the left looks like it but I think the curtains are meant to run behind the flat valance. It's a bit difficult to see what's going on here - there is a lot of fabric! - but I think the curtains were meant to slide in front of the two swags, with the tails on either side just staying where they were. The only image from outside the UK shows a room in Stuttgart, Germany from ca 1845, a charming lady's sitting room, entirely done up in chintz and with a large plant arrangement in the corner. 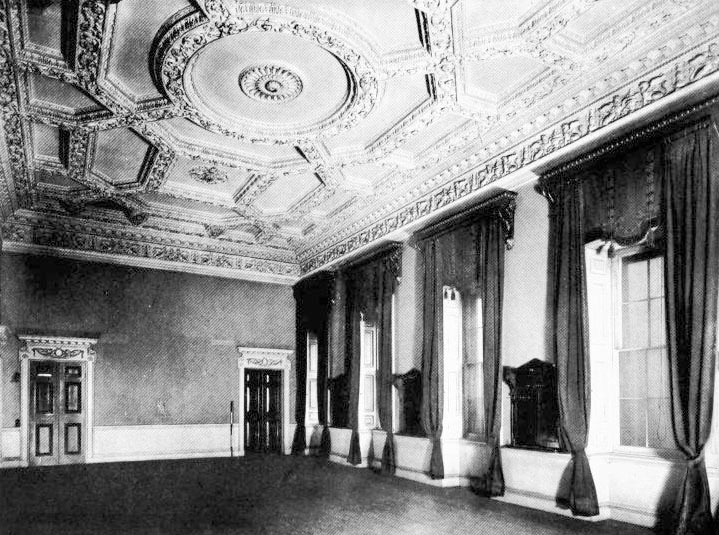 The house was built for King Charles I of Wurtemberg, who was married to a daughter of the Tsar of Russia, which is where those corner plantings were particularly popular. Here there are wooden poles with the flat pelmets behind the curtains, while the door has the same pole and curtains, but without the pelmet. I, myself, would have hung the door curtains just a bit higher, on the same level as the others ... perhaps it was felt that the door would then have needed a pelmet as well - but in a room as upholstered like this, I think I would have done that. After this image from the late 1840s, I have found nothing until 1907, when Cumberland House, London was photographed just prior to its sad demolition. This town palace was built for a Royal Duke in the 1760s, the time of Robert Adam, with a large amount of wall space above the windows. 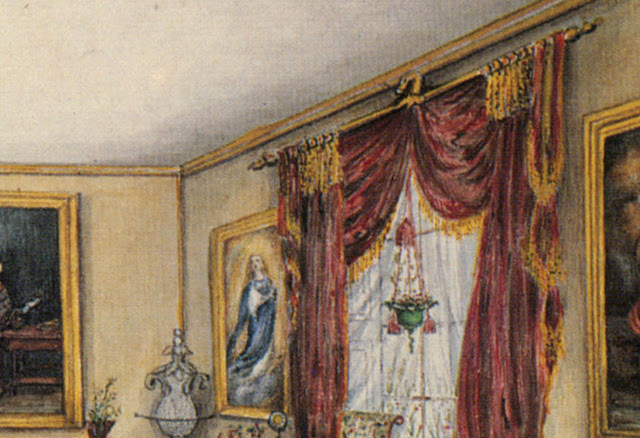 Here, instead of the swags and tails that must have been there originally, there are deep, flat pelmets, fitted behind the curtains that hang from heavy, Victorian poles, with Italianate brackets and their own cornices. 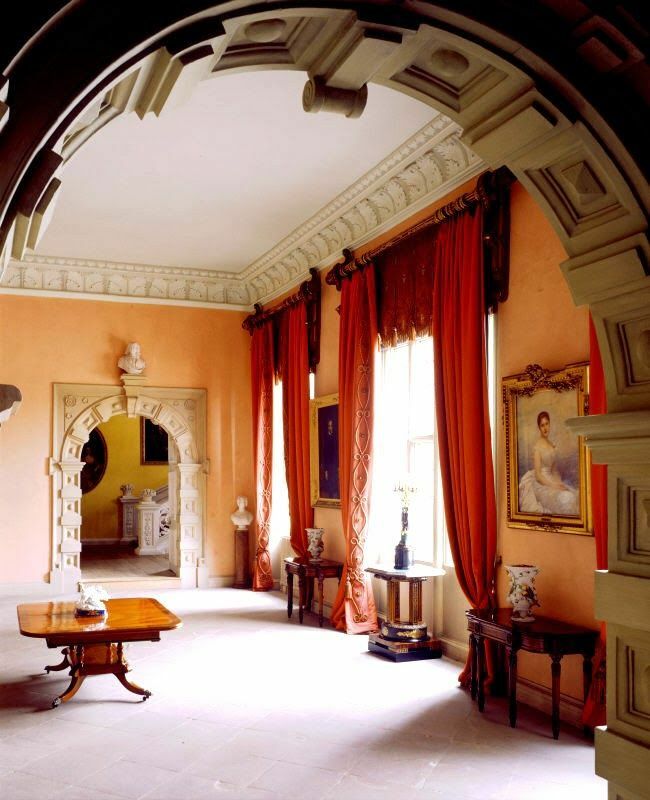 These are very similar to curtains that survive at Sudbury Hall, a beautiful house in Suffolk (through the arch can just be seen the carved staircase that John Fowler whitewashed, against his famous 'Sudbury yellow'). 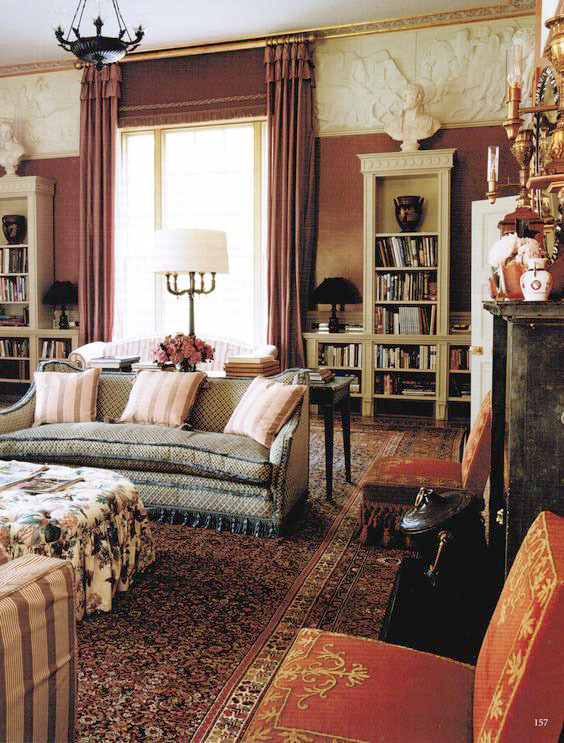 I love the chunky poles and sense of height; other types of pelmet would have cut across the curtains and lowered them visually. Not so long ago, the interiors of Frogmore House, another royal residence (in the park of Windsor Castle), were restored to a mid nineteenth century appearance and there is a lovely kind of gallery with a whole series of this type of curtain pelmet arrangement. 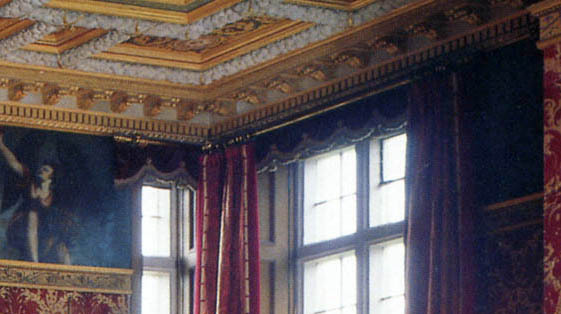 There are also some very pretty pelmets at Longleat House, which just hide the tops of the windows. Although these are 'pelmets behind poles', their modest size, scalloped profiles, fringes and tassels are reminiscent of the lambrequins of the 17th century, but that is a blog subject for another day. 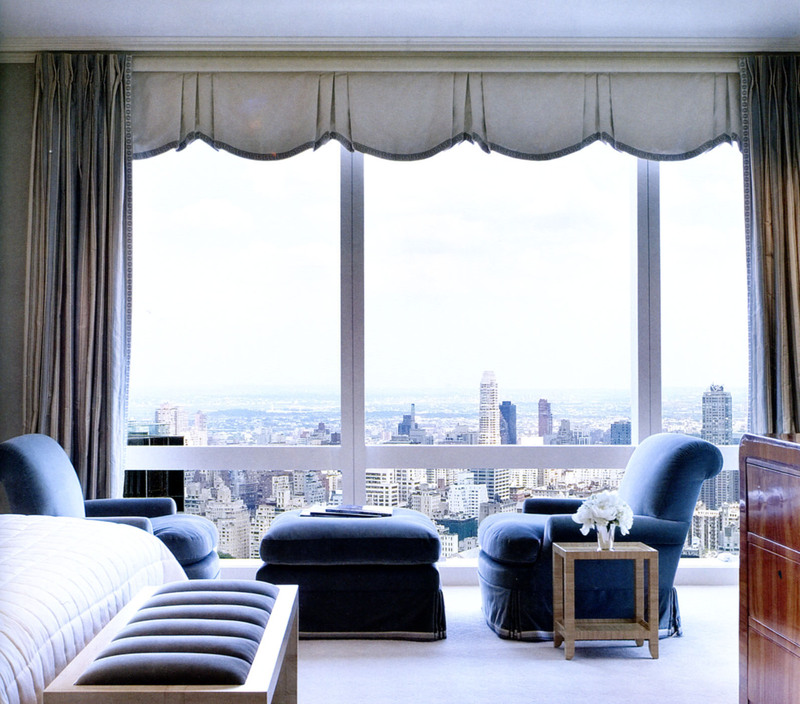 In the meantime, here is contemporary room by Alexa Hampton, which shows how effective a 'pelmet behind a pole' can be - even in a skyscraper. I know the title 'pelmet behind a pole' is not very poetic, so, as with my previous post about 'chandelier socks' some of my readers may suggest another name! 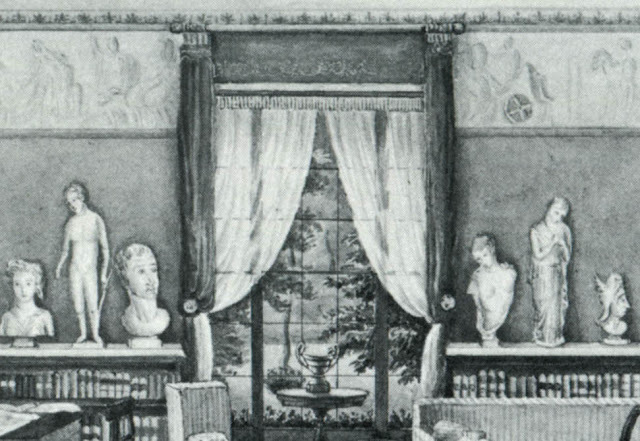 I would also be very appreciative of other images of these very 'Curious Curtains'. Stanley House, photo = found on Pinterest. 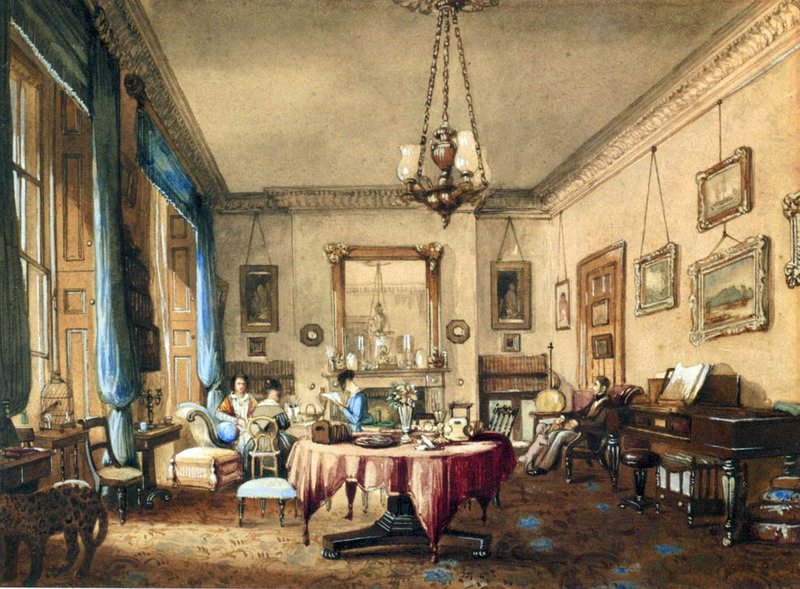 Stanley House, watercolour = in: John Cornforth, English Interiors 1790-1848. Gillows Design = in: John Fowler/John Cornforth, English Decoration in the 18th century. 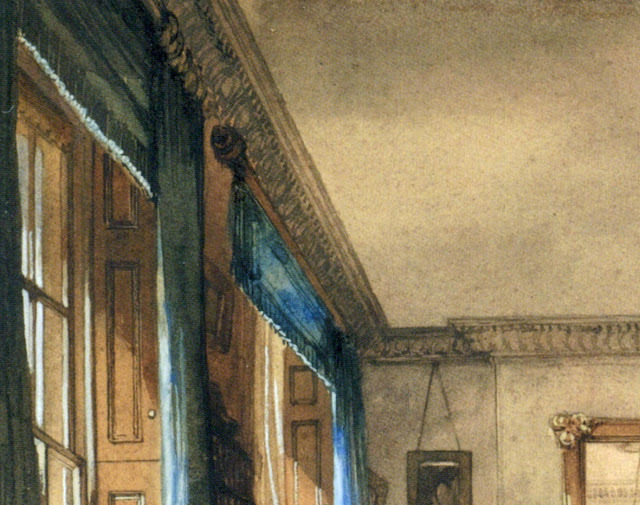 Interior with blue curtains = in Davids/McCarron-Cated/Gere, House Proud - 19th century watercolour interiors from the Thaw Collection. Interior at Aynhoe = in: Lily at Aynhoe , watercolours by Elizabeth Cartwright - Hignett, Aynhoe House, between 1835 and 1847. 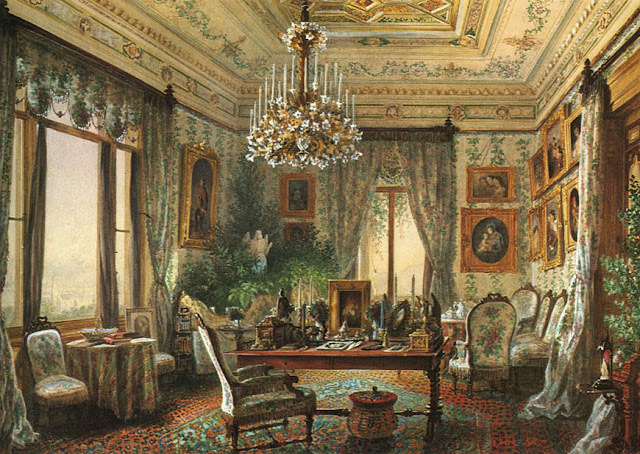 Stuttgart interior = in : Peter Thornton, Authentic Decor. Cumberland House = found on website 'British History Online'. 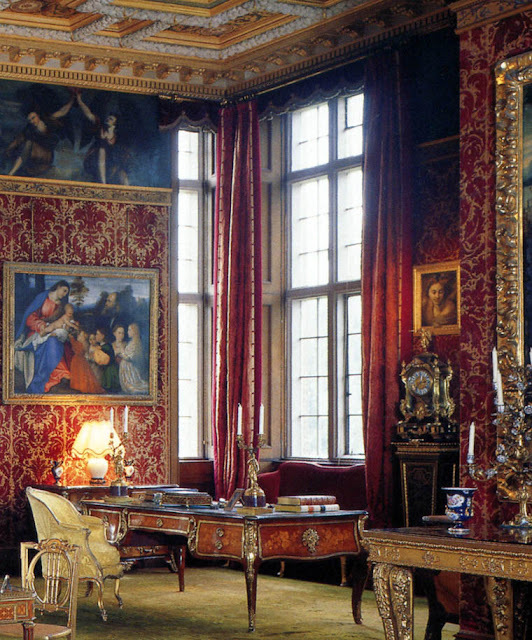 Sudbury Hall = photograph Andreas von Einsiedel. 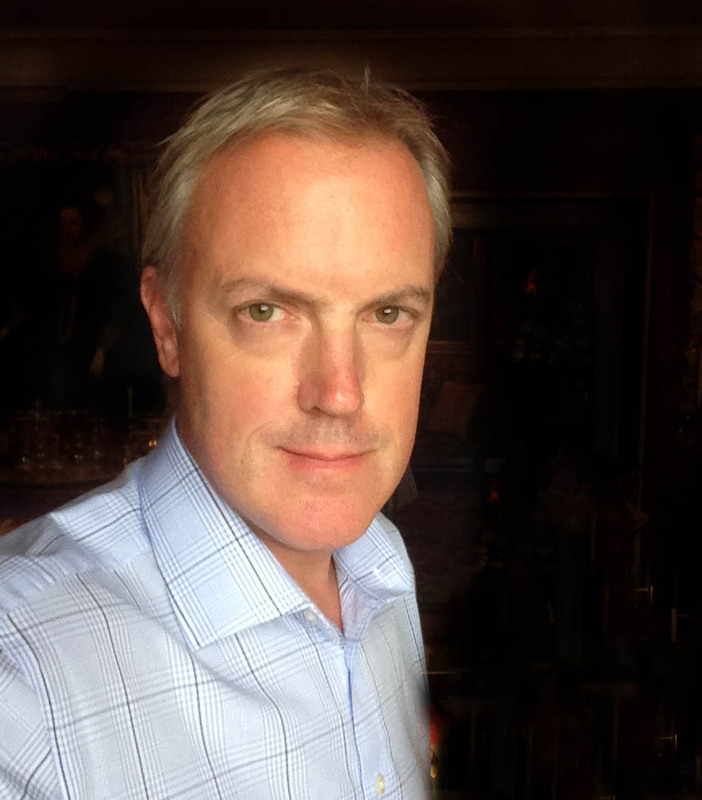 An interesting observation, putting the valance behind the curtain. From the examples you give, I think it can give a rather refined effect, without drawing too much attention to the curtains. I think this is a great idea - very useful and dealing with windows that are out of proportion. Thank you for sharing this. Fascinating! It's a clever invention that solves a number of different challenges presented with tall window treatments. I like the effect very much. Thank you for this very interesting post. Not my favorite curtain solution, but you made a compelling case for its acceptance. 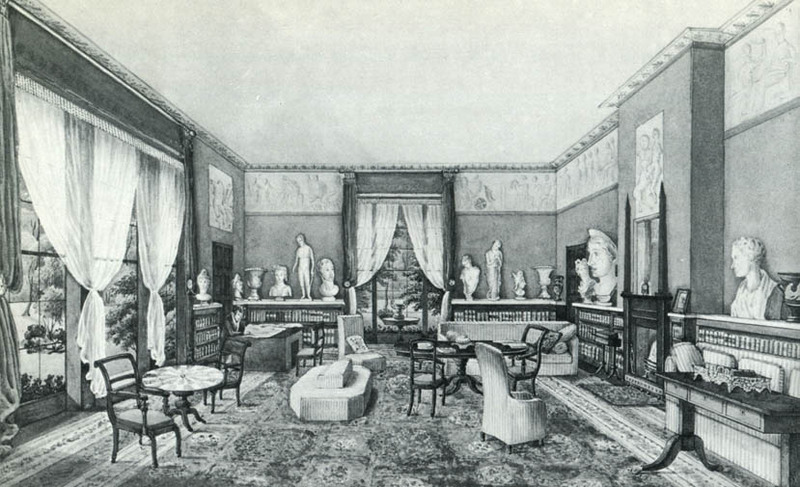 These are musings by an enthousiast for interiors and historic interior views and although I try to get as many facts and dates right, I will probably not succeed every time.